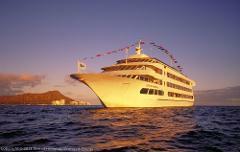 Including four spacious decks and six dining rooms, the Star of Honolulu is Hawaiis largest and only A.D.A. compliant vessel. Start off the night with a champagne toast and welcome hula performance aboard Hawaiis largest luxury tour vessel. The apex in luxury and romance on the islands for any special occasion, the Star of Honolulu 5-Star Dinner Cruise will be a night you will always remember. Enjoy an afternoon of whale watching and lunch off the coast of Oahu with our afternoon tour with the Star of Honolulu.